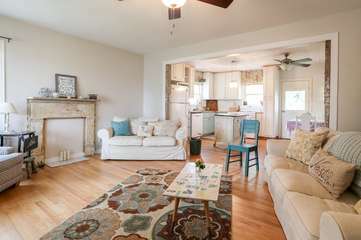 Located just one mile north of Main St. in Fredericksburg, this fully renovated house is both comfortable and elegant. Inside this cozy property is a living/dining and kitchen area with original hardwood floors. Enjoy the elegant shabby chic décor in the living room especially in the comfy sofa and chair. Both are placed to enjoy the television with DVD player. A full kitchen offers a range/oven, large refrigerator, dishwasher, microwave, coffeemaker and toaster. A small bistro table is perfect for that quiet coffee time. The spacious master bedroom's king bed offers . The second bedroom's focal point is the black iron headboard of the queen size bed topped with a white coverlet and fluffy pillows. Adjacent to both bedrooms is a bath with a walk in shower. A Bushel & A Peck was a wonderfully cozy home. The full kitchen was useful and the home had all you would need away from home. We got to stay at this cute home for a couple of nights and loved it! It’s a simple vintage home with such a great vibe. We really enjoyed the natural lighting in the home and had a super comfy stay. It isn’t too far from downtown either! We definitely can’t wait to be back.